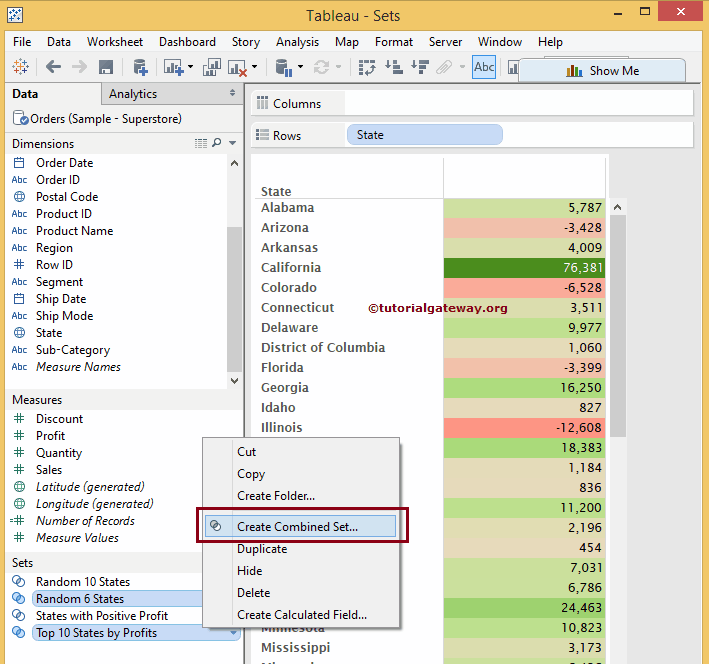 The Combined Sets in Tableau are very useful to compare two existing sets for further analysis. 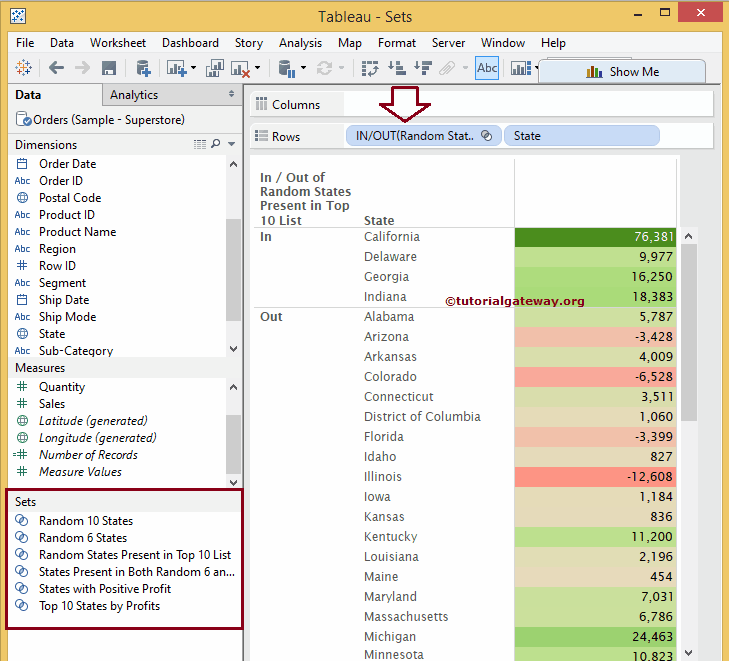 In this article, we will show you, How to Create Combined Tableau Sets with an example. 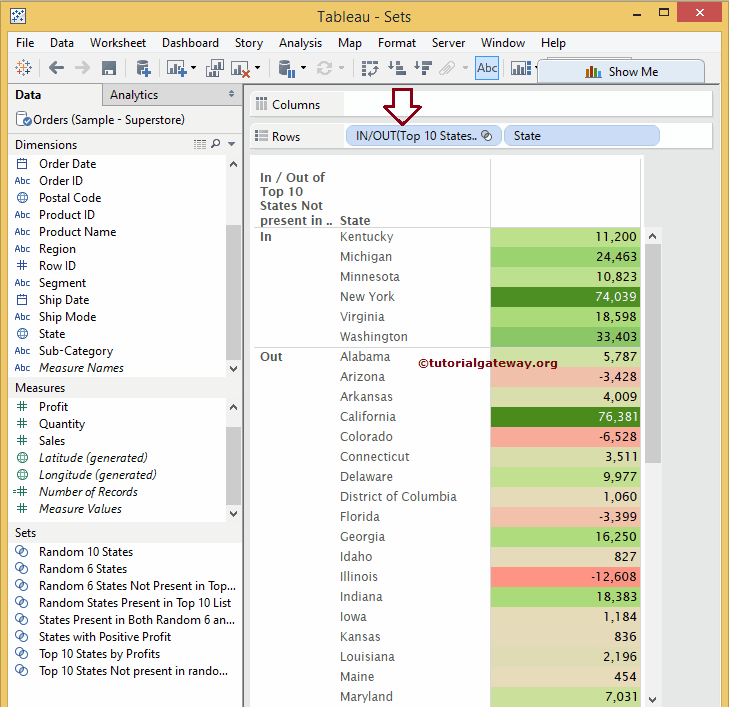 For this Tableau combined sets example, we are going to use the Super Store sample excel file downloaded from the Tableau website. 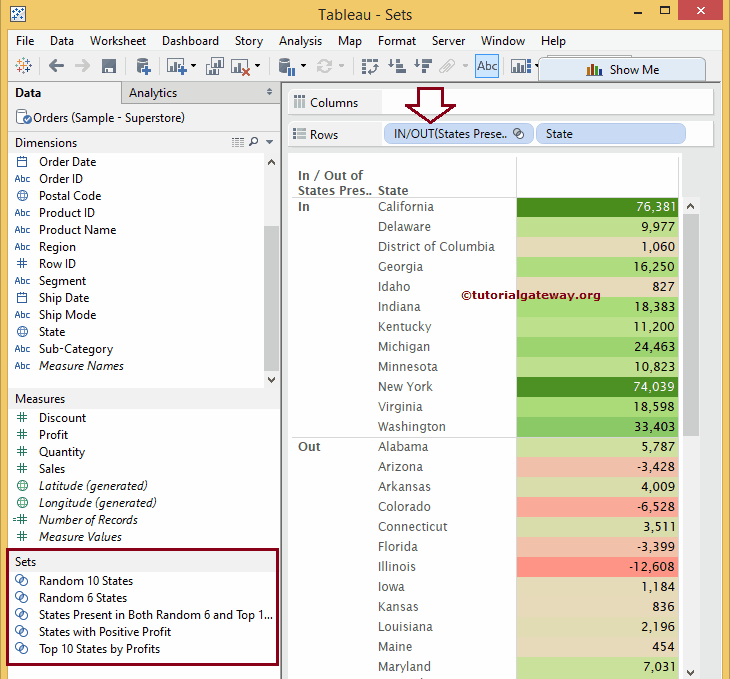 Please visit Connecting to Excel Files in Tableau article to understand, How to connect and extract data from an Excel file. Before we start creating combined sets in Tableau, we have to understand the properties present in Combined tableau sets. Name: Please specify the Unique name for the set. Make sure, the name should reflect the set functionality. 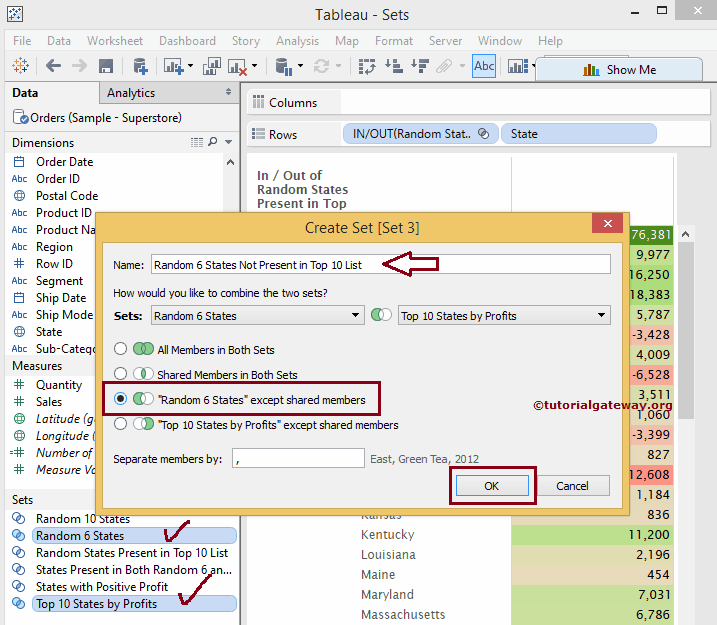 All members in Both Sets: This option is similar to SQL Full Join. If you select this option then Combined Set will hold all the members from Left Set and Right Set. Left Set Except Shared Members: If you select this option then Combined Set will hold all the members from Left Set except matching members from Right Set. Right Set Except Shared Members: If you select this option then Combined Set will hold all the members from Right Set except matching members from Left Set. In this example, we will show you, How to create Combined Tableau Sets. To create Combined Sets we need two sets. So, we are going to use sets that we created in our previous article. 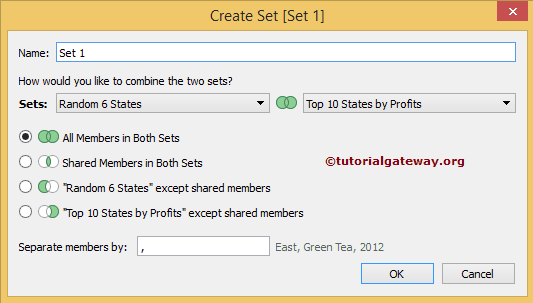 Please refer Tableau Set article to understand the creation of Sets. 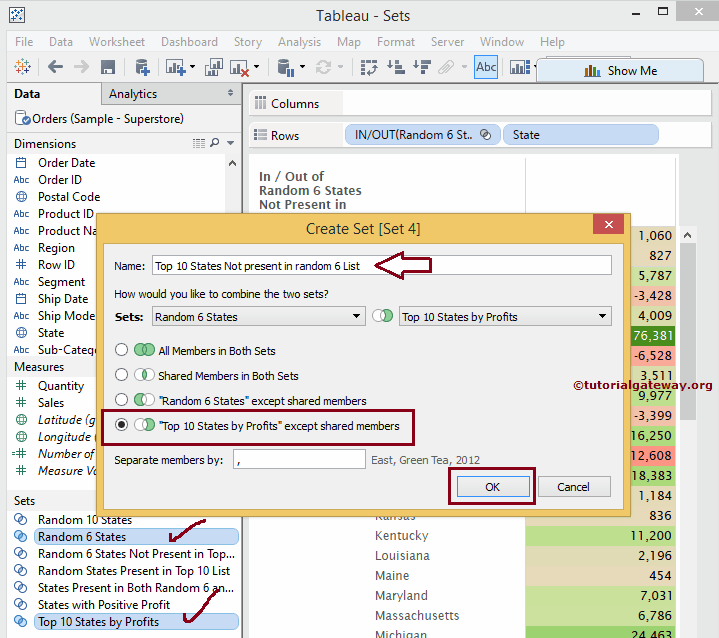 In order to create Combined Tableau Sets, Please select two Sets from the Sets region and right-click on it will open the context menu. Please select Create Combined Set… option from the context menu. 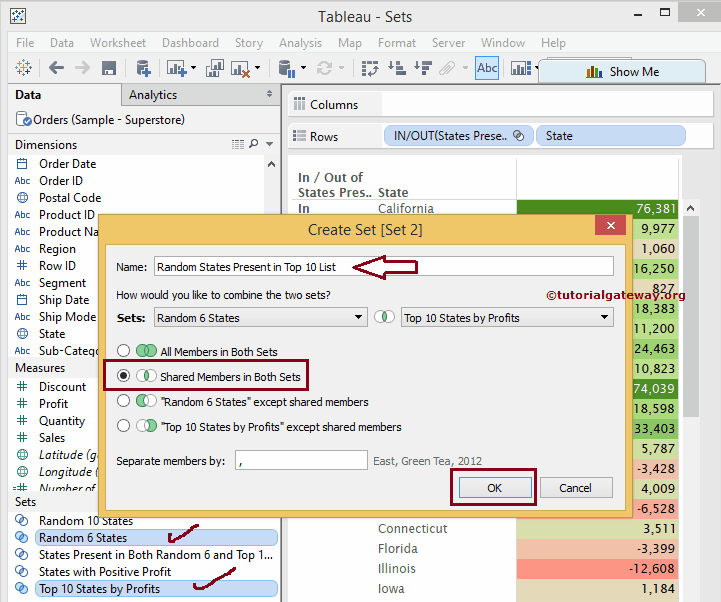 In this example, we are using Random 6 States and Top 10 States By Profits as shown below. Once you select Create Combined Set… option, a new window called Create Set will be opened to configure the option. Click OK to finish Creating our first Combined tableau Sets. 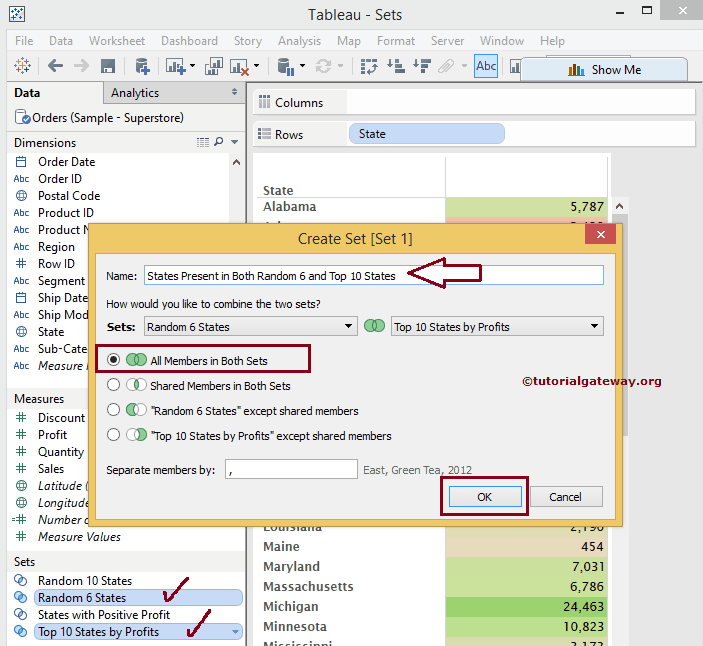 Next, Please Drag the newly created set (States Present in Both Random 6 and Top 10 States) from Sets region to Row Shelf. And place it before the State filed as shown below. From the above listing, you can observe that tableau report is displaying 12 records in IN section. This is because, there are 16 records in both Random 6 States (6) and Top 10 States By Profits (10) sets and within that 16, there are 4 common records so it is displaying 12 records. Click OK to finish creating new Combined Set. 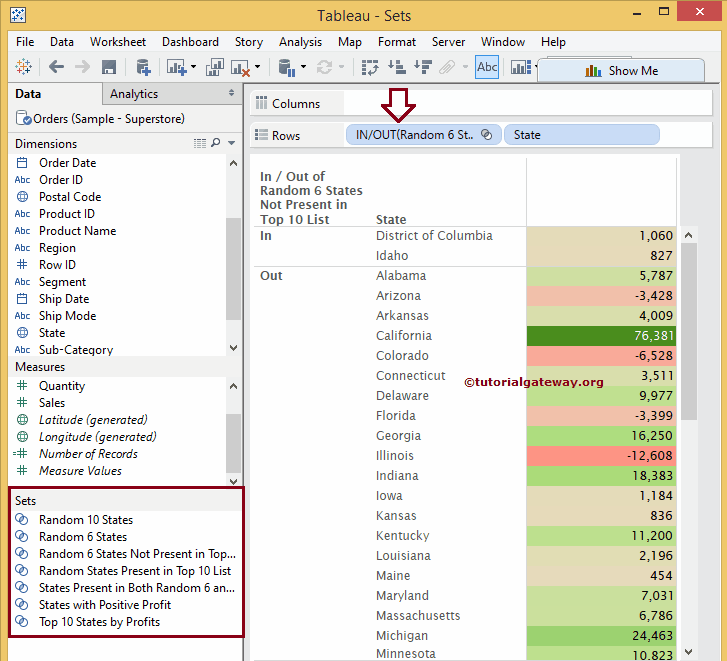 Let us replace the States Present in Both Random 6 and Top 10 States set with our newly created set, called Random States Present in Top 10 List and see the result. From the above listing, you can observe that California, Delaware, Georgia and Indiana are the common fields in Random 6 States and Top 10 States By Profits sets. From the above listing, you can observe that tableau report is displaying 2 records (District of Columbia and Idaho ) in IN section. This is because there are 6 records in Random 6 States. And within that 6, there are 4 common records in Random 6 States and Top 10 States By Profits sets. So it is displaying 2 records. Click OK to finish creating new Combined Set. Let us replace the Random 6 States not Present in Top 10 List set with our newly created set, called Top 10 States Not present in random 6 List and see the result.